Here, we present a protocol to describe a simple recovery cardiopulmonary bypass model without transfusion or inotropic agents in a rat. This model allows the study of the long-term multiple organ sequelae of cardiopulmonary bypass. Hirao, S., Masumoto, H., Itonaga, T., Minatoya, K. A Recovery Cardiopulmonary Bypass Model Without Transfusion or Inotropic Agents in Rats. J. Vis. Exp. (133), e56986, doi:10.3791/56986 (2018). Cardiopulmonary bypass (CPB) is indispensable in cardiovascular surgery. Despite the dramatic refinement of CPB technique and devices, multi-organ complications related to prolonged CPB still compromise the outcome of cardiovascular surgeries, and may worsen postoperative morbidity and mortality. Animal models recapitulating the clinical usage of CPB enable the clarification of the pathophysiological processes that occur during CPB, and facilitate pre-clinical studies to develop strategies protecting against these complications. Rat CPB models are advantageous because of their greater cost-effectiveness, convenient experimental processes, abundant testing methods at the genetic or protein levels, and genetic consistency. They can be used for investigating the immune system activation and synthesis of proinflammatory cytokines, compliment activation, and production of oxygen free radicals. The rat models have been refined and have gradually taken the place of large-animal models. Here, we describe a simple CPB model without transfusion and/or inotropic agents in a rat. This recovery model allows the study of the long-term multiple organ sequelae of CPB. In 1953, Dr. John H. Gibbon Jr. successfully performed the first cardiac surgery using CPB1, and it subsequently became an essential modality in cardiovascular surgery. While the techniques and devices have been dramatically refined, multi-organ complications related to CPB still compromise the outcome of cardiovascular surgeries, and may affect postoperative morbidity and mortality2. CPB-related organ damage is caused by immune system activation and synthesis of proinflammatory cytokines, compliment activation, and production of oxygen free radicals2. Its pathophysiology, however, has not been fully elucidated. Animal models recapitulating the clinical usage of CPB enable the clarification of the pathophysiological processes during and after CPB; this can facilitate pre-clinical studies in developing strategies to avoid these complications. Since Popovic et al. first reported a rat CPB model in 19673, rat CPB models have been refined, and have gradually taken the place of large-animal models due to greater cost-effectiveness, convenient experimental processes, and a plethora of testing methods in genetic and protein levels. Additionally, inbred rats can be genetically identical, reducing possible biological biases. Fabre et al. first established a recovery model that allowed the study of the long-term multiple organ sequelae of CPB4. The advantages of this simple survival model are the flexibility (CPB flow and duration), stable vital condition, and reproducibility in systemic inflammation. 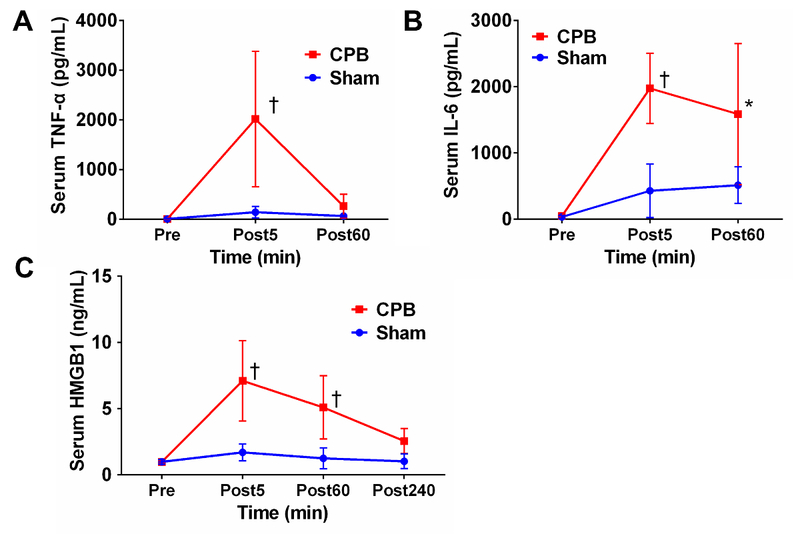 Rat CPB models have become crucial for the investigation of therapeutic strategies that aim to prevent multi-organ injury during CPB5, and various models for simulating the clinical situations during CPB have recently been developed. De Lange et al. 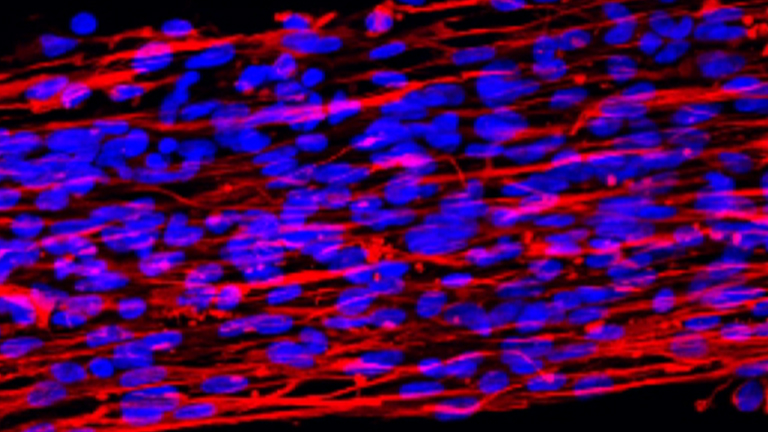 developed a cardiac arrest model, which can be used to characterize the enzymatic, genetic, and histological responses related to myocardial injury7. Peters et al. arranged myocardial infarction and controlled reperfusion using a miniaturized CPB model to analyze heart disfunction through the focal ischemia and reperfusion injury8. Jungwirth et al. first established a deep hypothermic circulatory arrest (DHCA) model, which can elucidate the global ischemia and reperfusion injury by DHCA and supports potential neuroprotective strategies6. Studies using DHCA investigate the influence of hypothermia, reperfusion, and/or hemolysis-triggered signaling events9. Deep hypothermia may affect the activation and inactivation of various enzymes and pathways and the mechanisms remain unknown10. On the other hand, cardiac arrest models or heart ischemia models must be used to investigate ischemia and reperfusion heart injury. These various rat CPB models that highly recapitulate human CPB may reveal pathological processes related to CPB and help mitigate CPB-related complications. This protocol demonstrates a simple CPB model without transfusion or inotropic agents in a rat. This model allows for the study of long-term multiple organ sequelae of CPB. Prior to experiment, all rats should be given one week to acclimate. All surgical procedures on animals should be carried out in accordance with the Guide for the Care and Use of Laboratory Animals (www.nap.edu/catalog/5140.html) or other appropriate ethical guidelines. Protocols should be approved by the animal welfare committee at the appropriate institution before proceeding. All subsequent procedures must be performed under aseptic conditions. Note: Wear personal protective equipment including gloves, eyewear, and a clean coat or disposable gown. 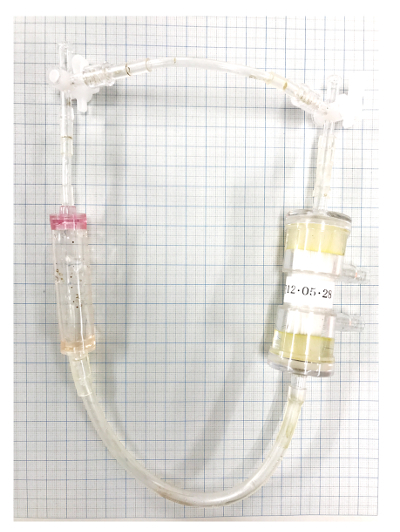 Connect polyvinyl chloride tubes with a venous reservoir, predesigned for CPB circuit, and a modified neonatal membrane oxygenator as shown in Figure 1. Ensure all connections are tight and do not leak water. Set a CPB circuit to the roller pump device according to the manufacturer's protocols. Keep the roller pump on a height-adjustable table and adjust the table's height to 10 cm below the experimental desk. Mix 12 mL of hydroxyethyl starch solution with 0.1 mL of heparin and 0.5 mL of 7% sodium bicarbonate solution for priming CPB circuit. Prime the circuit with 11 mL of the priming solution, with the pump roller gently rotating. 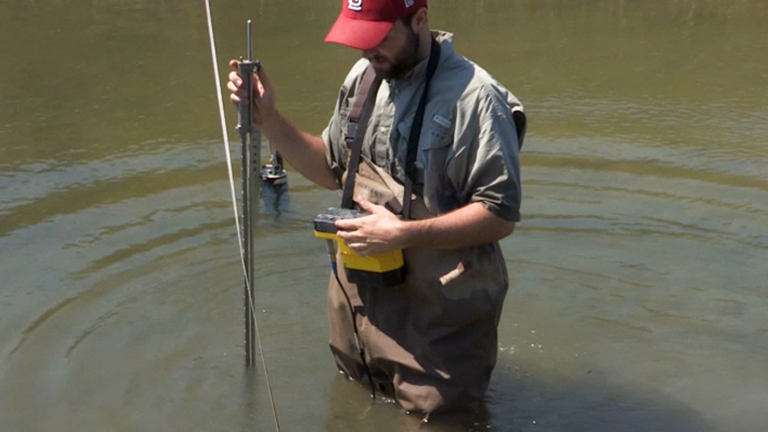 Put an 18-gauge venting needle into the reservoir for venting air. Hit the membrane oxygenator several times to deair, with tilting the oxygenator. Air must be obscured completely to avoid air embolism and insufficient oxygenation. During the circuit priming, heat the circuit by an electric heat lamp set on the reservoir. NOTE: The surgical field and devices should be disinfected by 70% alcohol or a quaternary ammonium compound before use. Anesthetize a rat with 3.0% isoflurane-mixed air inhalation in a vaporizer. Set the rat on a work-stand and intubate a 16-gauge cannula into the trachea. Follow your local animal care guidelines regarding analgesia dosage and frequency (e.g. ​NOTE: Rats must be at deep anesthesia and lose reflexes. The respiration should be rhythmic but not be arrested. Transfer the rat to an operating table equipped with an electric heating pad. Start the mechanical ventilation with 8 mL/kg of tidal volume, a respiratory rate of 70 cycles/min, and 30% of inspired oxygen fraction monitored by the oxygen sensor. Maintain the anesthesia with 1.5-2.0% isoflurane, and with an additional administration of ketamine/xylazine at CPB initiation. Monitor the rectal temperature by using the rectal probe. Maintain normothermic body temperature of 37 °C by adjusting the temperature of the heat pad and placing the circuit over the heat lamp. Set the rat in supine position and stretch the four limbs by fixing with needles. Monitor the heart rate by setting the ECG electrode needle to the bilateral shoulder and left abdomen. Place a moist gauze or apply ophthalmic ointment to the eyes to prevent dryness. After disinfecting the surface of the whole body by sprayingby spraying 70 % ethanol or another antiseptic solution, shave the hair by a razor on the bilateral inguinal region and right cervical region. Local anesthetics (such as lidocaine) should be used before making the skin incision. NOTE: As an alternative, a surgical scrub of the incision site can be used instead of the whole body spray of 70% ethanol to avoid a drop in body temperature. Incise the skin (approximately 5 mm) at the bilateral inguinal regions and right cervical region by scissors and bluntly dissect the tissues to expose the right main femoral artery. Separate the artery carefully from the vein and nerve nearby. Ligate at the end of common femoral artery by 4-0 silk and exposure by tension. Cut the arterial wall (approximately 1 mm) of right common femoral artery by micro scissors in perpendicular direction to the artery, and carefully cannulate a 24-gauge intravenous catheter from the incision to a depth of 1 cm for monitoring systemic arterial pressure and analyzing gas partial pressure in arterial blood. Administrate heparin sodium (500 IU/kg) from the catheter. Follow steps 2.2.2 and 2.2.3 to cannulate a 24-gauge intravenous catheter into the left common femoral artery as an arterial infusion line for the CPB circuit. Insert a 17-gauge multi-orifice angiocatheter into the right internal jugular vein and advance it into the right atrium and inferior vena cava (IVC). Do not push the catheter roughly as the vessel can easily break. Connect the catheter to the CPB circuit for venous drainage. Cover each cannulated region with a moist gauze to avoid contamination. Deliver 100% oxygen gas to the oxygenator at 0.8 L/min during CPB and decrease the respiratory rate to 30 cycles/min. The arterial oxygen partial pressure is required from 200 to 400 mmHg. At the beginning of CPB, increase the temperature setting of the heat pad to the maximum, 42 °C, to mitigate the immediate drop of the body temperature after CPB initiation. Adjust the setting temperature to 37 °C when the body temperature returns to 36 °C. Carefully start the CPB flow and keep an eye on the volume of the blood in the reservoir. An empty reservoir may cause air embolism. If the volume of the blood in the reservoir decreases, lower the pump flow by adjusting the table height, or changing the position of the drainage catheter. Do not re-position the venous drainage catheter, which might easily cause perforation of the right atrium and/or arrhythmia. Increase and keep the pump flow at 100 mL/kg/min, while the mean blood pressure is maintained at 70 mmHg. When the appropriate blood pressure is maintained, a small volume of at least 1 mL in the reservoir is acceptable. If there is less than 1 mL of the blood in the reservoir, it may cause an air embolism in organs. If the blood pressure is unstable, add 2-3 mL of the priming solution to the circuit (it may cause anemia after the CPB). Clamp the venous drainage tube and remove it from the circuit. Infuse the remaining blood in the circuit gradually to the artery to maintain the blood pressure. Increase the respiratory rate to 70 cycles/min. Remove the venous drainage catheter and the left arterial catheter, then ligate the vessel in the proximal and distal site. Remove the arterial line from the right femoral artery 60 min after the end of CPB. Clean each wound with saline and close the wound with sutures. End the anesthesia and extubate the intratracheal tube after checking the spontaneous breathing of the animal. Administer warmed sterile isotonic fluids, and use a heat mat and electrical heat lamp to keep the animals warm. Check the conditions of the animal frequently until recovery from anesthesia. Provide respiratory support when required. NOTE: Once the animal begins moving around, the heat source should be removed from part of the cage to allow the animal to choose the warm or cool side. Keep the animal apart from the company of other animals until the respiration fully regains. Do not return the animal to the company until full recovery. Check the food and water intake after the recovery from anesthesia and provide appropriate nutritional support. Administer analgesics and check for signs of discomfort or pain. Figure 1 shows the entire CPB circuit. The physiological variables in this model are shown in Figure 2, and include rectal temperature, mean arterial blood pressure, and heart rate. Figure 3 shows the arterial blood gas analyses during CPB, including partial pressure of arterial oxygen, partial pressure of arterial carbon dioxide, hematocrit, base excess, serum expression of potassium, and potential of hydrogen. Throughout the procedure, the heart rate and mean arterial pressure were stable. The rectal temperature and hematocrit decreased at the beginning of CPB because of hemodilution caused by the priming volume. The partial pressure of arterial oxygen significantly increased during CPB due to membrane oxygenation. 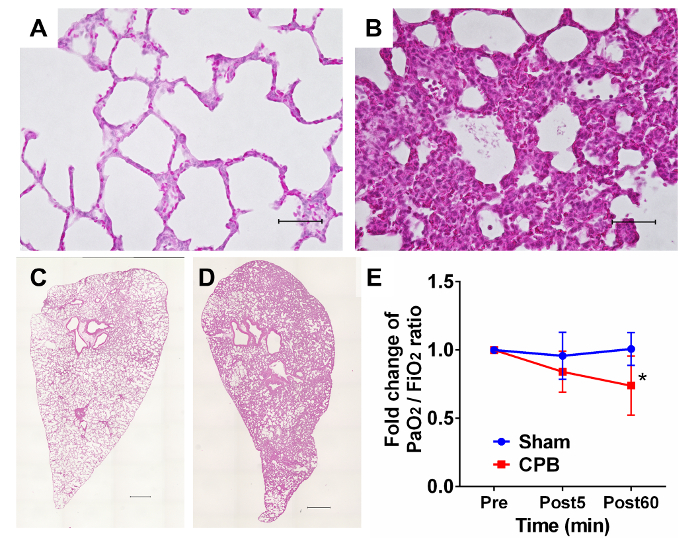 Representative hematoxylin and eosin staining images of lungs are shown in Figure 4, which includes the images of the CPB group (Figure 4B, D) and sham operation group (Figure 4A, C), and the ratios of PaO2/FiO2 after CPB compared with the baseline (Figure 4E). For interstitial edema, inflammatory cell infiltration, and hemorrhage, a significant difference was observed in the CPB group. Figure 5 shows serum concentration of tumor necrosis factor-α (TNF-α), interleukin-6 (IL-6), and high mobility group box 1 (HMGB1) levels after CPB. Figure 1: The CPB circuit. The entire CPB circuit consists of a reservoir (8 mL), a membrane oxygenator with a priming volume of 3.3 mL, and a roller pump. All parts are connected via polyvinyl chloride tubes, including a venous drainage line (outer diameter (OD), 3.3 mm; inner diameter (ID), 2 mm; about 1.4 mL), an arterial line (OD, 2 mm; ID, 1.2 mm; about 1.2 mL) and a tube attaching the pump roller (OD, 6.6 mm; ID, 4.5 mm; about 2.8 mL). Total priming volume is 11 mL including approximately 3 mL in the reservoir. Please click here to view a larger version of this figure. Figure 2: Physiological variables. Physiological variables during and after CPB, including (A) rectal temperature, (B) mean arterial blood pressure, and (C) heart rate (n = 6). The points and error bars are presented as mean and standard deviation. CPB, cardiopulmonary bypass; Pre, before CPB; CPB X, X min after the initiation of CPB; Post X, X min after the end of CPB. Please click here to view a larger version of this figure. Figure 3: Arterial blood gas analyses. 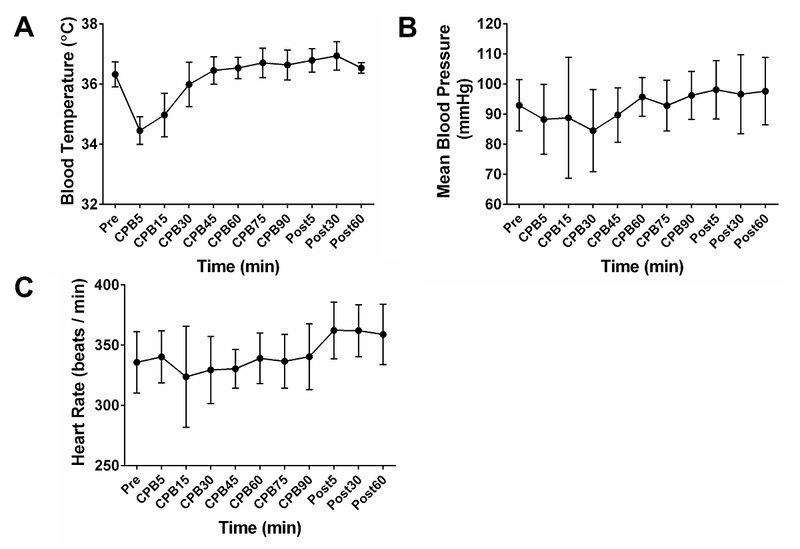 Arterial blood gas analyses during and after CPB. (A) partial pressure of arterial oxygen, (B) partial pressure of arterial carbon dioxide, (C) hematocrit, (D) base excess, (E) serum expression of potassium, and (F) potential of hydrogen (n = 6). The points and error bars are presented as mean and standard deviation. CPB, cardiopulmonary bypass; Pre, before CPB; CPB X, X min after the initiation of CPB; Post X, X min after the end of CPB. Please click here to view a larger version of this figure. Figure 4: Histological analysis for lungs. Representative hematoxylin and eosin staining images for the sham operation group (A, C) and the cardiopulmonary bypass performed group (B, D). 4 h after CPB. The severity of respiratory distress was correlated to the extent of pathological findings in edema and hemorrhage. Scale bars; 50 µm (A, B), 1 mm (C, D). (E) The ratio of PaO2/FiO2 after CPB compared with the baseline in sham group and control group (n = 6 in each group). The points and error bars are presented as mean and standard deviation. *p < 0.01 vs. Sham group. CPB, cardiopulmonary bypass; PaO2, partial pressure of arterial oxygen; FiO2, fraction of inspired oxygen; Post X, X min after the end of CPB. Please click here to view a larger version of this figure. Figure 5: Evaluation of inflammatory responses in serum. Serum concentration of (A) tumor necrosis factor-α (TNF-α), (B) interleukin-6 (IL-6), and (C) high mobility group box 1 (HMGB1) levels after CPB. n = 5 for each group: Sham group and CPB group, rats undergoing CPB. The points and error bars are presented as mean and standard deviation. *p < 0.05, †p < 0.001 vs. Sham group. CPB, cardiopulmonary bypass; Post X, X min after the end of CPB. Please click here to view a larger version of this figure. In this rat CPB model, the serum and lung expression levels of inflammatory cytokines and HMGB-1, a key transcription factor regulating the inflammatory responses, dramatically increased after CPB. Previous clinical studies showed that the serum secretion of HMGB-1 level is elevated in patients undergoing cardiovascular surgery11, and the peak serum HMGB-1 level during CPB was associated with more severe systemic inflammatory response syndrome and lung oxygenation impairment after CPB12. Additionally, the serum HMGB-1 level is an independent biomarker to predict intensive care unit mortality in patients with severe pneumonia and acute respiratory distress syndrome (ARDS)13. Severe CPB-related ARDS associated with inflammatory cytokines and HMGB-1 activation is successfully simulated by this rat CPB model. Numerous studies on CPB-related systemic inflammation have been conducted in rat models because of their usefulness for investigating the systemic inflammatory responses, including proinflammatory cytokine expression14, nuclear kappa B activation15, neutrophil activation by adhesion molecules16, and matrix metalloproteinase-9 activities17. Oxidative stress such as the activation of the HO-1 protein during CPB has been also investigated by using rat CPB models18. The rat CPB model has recently been developed in various procedures to simulate the clinical situations of complications from CPB. The enzymatic, genetic, and histologic effects for myocardium can be investigated by a cardiac arrest model7. Moreover, a DHCA model is reported to reveal the mechanisms associated with adverse cerebral outcome after thoracic aortic surgery, and to investigate potential neuroprotective strategies6. These models, based on the conventional rat CPB model, are valuable to evaluate the various effects of CPB, closely mimicking clinical situations in cardiovascular surgeries. The survival rate of this model depends on the investigator's technical improvement. The most critical factors related to morbidity are bleeding during the separation of vessels, cardiac rupture, and retroperitoneum hematoma, which generally occurs from technical failure. Good exposure, appropriate tension to the vessels, and gentle cannulation are surgical requirements for success. Keeping the mean blood pressure of at least 60 mmHg by controlling the reserved blood and additional solution is important for avoiding extreme anemia and lower limb deficiency. Air embolism to the intestine and/or other abdominal organs is also critical to avoid; once this occurs, the procedure cannot be completed. In early practice of these procedure, completion of CPB is approximately 20% because of the difficulty in cannulation, and up to 10% survival 4 h after CPB. After experience with 20 models, the survival rate dramatically improved to nearly 80% because of the stable hemodynamics during model preparation. At the beginning of establishing this model, total volume of the CPB circuit was 3 mL which is higher than that of the present one. Therefore, the excessive colloidal volume induced critical anemia during CPB (mean hematocrit: 14.7%)19. By decreasing the CPB circuit volume and surgical bleeding, the hematocrit during CPB dramatically increased to 21.3%, which allowed maintaining stable hemodynamics. The 17-gauge multi-orifice is very suitable for the cannulation from the internal jugular vein to IVC through the right atrium, because of its suitable length and softness, which prevents wearing out of the venous wall. Moreover, the multi-orifice and sufficient inner diameter allows sufficient venous return and a high success rate. Introducing the catheter into IVC is technically difficult because of its blind manner and would easily perforate the venous or atrial wall. Arterial cannulation for the femoral artery of rats tends to cause limb ischemia compared to tail artery or carotid artery20. In our experience, instability of hemodynamics (mean BP less than 60 mmHg), ligation of the deep femoral artery, and critical anemia may cause severe leg damage. Maintaining blood pressure, cannulating a higher region of the common femoral artery, and keeping a higher hematocrit are all solutions to prevent limb ischemia caused by the innate rich collateral perfusion of rats. Avoidance of catecholamine and blood transfusion is necessary to accurately investigate hemodynamic, biochemical and/or physiological responses of testing materials and interventions. There is no need for vasopressor and transfusion at all during the procedure in our model. Deep anesthesia augments the release of inflammatory cytokines and subsequently deteriorates organ function21. Appropriate anesthesia depth, smooth and gentle cannulation of the animal trachea for intubation, and femoral artery cannulation for blood pressure monitoring without bleeding are important before initiation of CPB. If there is hemodynamic instability before initiation of CPB, success rate will be remarkably decreased. During CPB, the flow rate of CPB must be maintained by adjusting the volume in the reservoir. At 60 min after initiation of CPB, the careful addition of volume (1-3 mL saline) is required because of the hemodynamic instability by inflammatory processes. However, the addition of excessive colloidal volume causes anemia which may lead to unstable conditions. After CPB, the blood in the CPB circuit should be returned to the rat gently in 30 min. Instability after CPB means that there is potential morbidity such as ischemia in limbs or intestine. The suitable anesthesia depth is one of tips in this model to decrease mortality and morbidity. Inhalant anesthetics provide adequate control of depth and duration of anesthesia. When we intubate a cannula to the trachea, rats must be at deep anesthesia enough to lose reflexes. The respiration should be rhythmic but not be arrested. Respiratory arrest indicates extremely deep anesthesia, hypotension, and/or imminent death, which causes systemic inflammation. Contrarily, insufficient anesthesia causes more stress to the animal. During CPB, body movement of the animal is critical to reduce because of possible accidental removal of the cannulas. Controlling the isoflurane vaporizer by monitoring heart rate, arterial pressure, and chest wall movement is required during the procedure. At the initiation of CPB, the blood concentration of isoflurane may decrease from dilatation by primed volume. Additional intraperitoneal pentobarbital may allow stable depth of anesthesia. Post-operative infections in rats will cause numerous changes in physiologic parameters22. A long survival model requires strict maintenance of sterile conditions during the procedure. A separate room and a clean working area for aseptic procedures are desirable. The surgical field and devices should be disinfected by 70% alcohol or a quaternary ammonium compound before use. Every material which likely affects contamination, such as cannulas, solutions, and suture materials, must be in a sterile pack. During CPB, covering the surgical field with moist small gauze prevents the sites from potential sources of contamination. Before closing the wounds, removing blood from the wound and rinsing it with sterile water are necessary to avoid wound infection. In our experience, no wound infection has occurred 24 h after the operation. There are limitations of this CPB model in that is cannot completely mimic clinical situations. Firstly, this heart beating model exhibits pulsatile flow which is different from clinical cardiac surgery with arrested heart. Secondly, this model can be conducted without thoracotomy, and this would not fully reproduce clinical CPB with median thoracotomy, which leads to massive bleeding during the surgical procedure. In conclusion, this recovery CPB model allows studies of early- and long-term multiple organ damage associated with CPB. Major advantages of this model include the reduction of possible biases by blood transfusions, vasopressors, or inotropic agents. This model is suitable to investigate therapeutic strategies aimed at preventing multi-organ injury during CPB. All authors have nothing to disclose regarding commercial support. Appreciation is extended to Dr. T. Taki and Dr. M. Funamoto for their technical support. Gibbon, J. H. Application of a mechanical heart and lung apparatus to cardiac surgery. Minn Med. 37, (3), 171-185 (1954). Apostolakis, E., Filos, K. S., Koletsis, E., Dougenis, D. Lung dysfunction following cardiopulmonary bypass. J Cardiac Surg. 25, (1), 47-55 (2010). 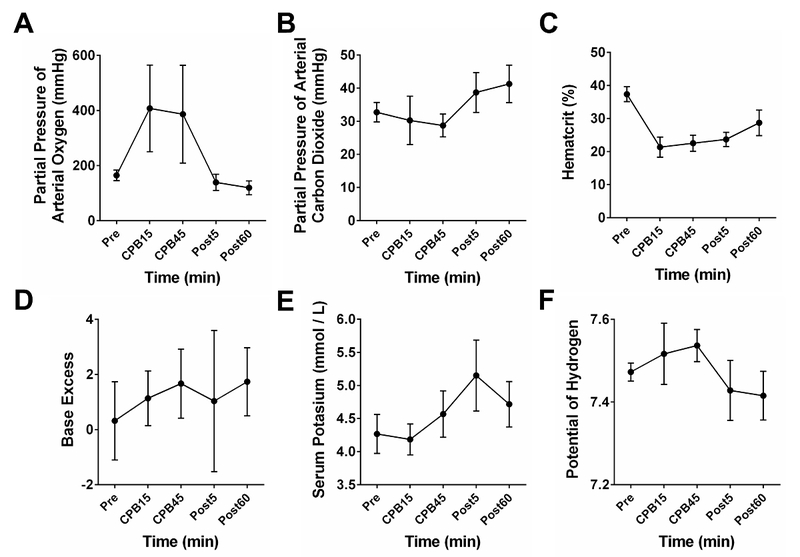 Popovic, P., Horecky, J., Popovic, V. P. Instrumental responses in rats after hypothermic cardiopulmonary by-pass. P Soc Exp Biol Med. 126, (1), 225-228 (1967). Fabre, O., et al. A recovery model of partial cardiopulmonary bypass in the rat. Perfusion. 16, (3), 215-220 (2001). Hirao, S., Masumoto, H., Minatoya, K. Rat cardiopulmonary bypass models to Investigate multi-organ injury. Clin Surg. 2, 1-6 (2017). Jungwirth, B., et al. Neurologic outcome after cardiopulmonary bypass with deep hypothermic circulatory arrest in rats: description of a new model. J Thorac Cardiov Sur. 131, (4), 805-812 (2006). de Lange, F., Yoshitani, K., Podgoreanu, M. V., Grocott, H. P., Mackensen, G. B. A novel survival model of cardioplegic arrest and cardiopulmonary bypass in rats: a methodology paper. J Cardiothorac Surg. 3, 51 (2008). Peters, S., et al. An experimental model of myocardial infarction and controlled reperfusion using a miniaturized cardiopulmonary bypass in rats. Interact Cardiovasc Th. 19, (4), 561-564 (2014). Engels, M., et al. 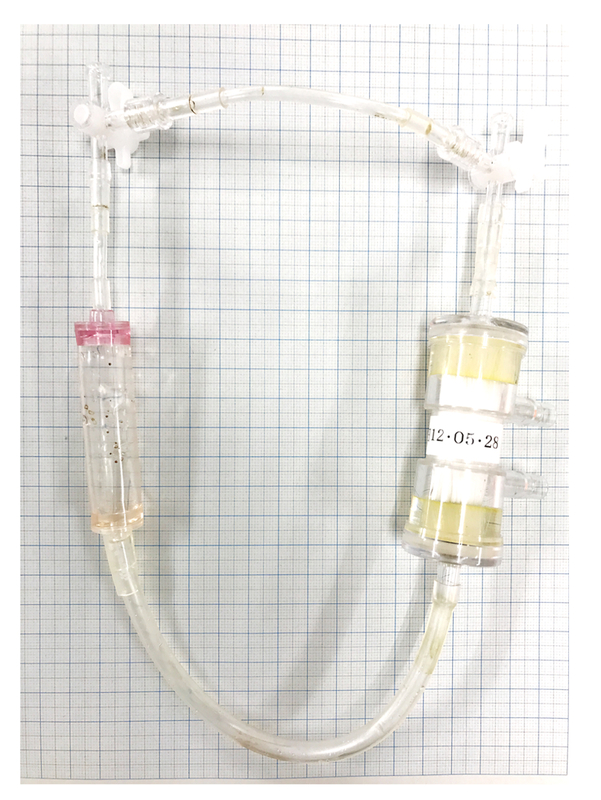 A cardiopulmonary bypass with deep hypothermic circulatory arrest rat model for the investigation of the systemic inflammation response and induced organ damage. J Inflamm. 11, (26), (2014). Pinto, A., et al. The extracellular isoform of superoxide dismutase has a significant impact on cardiovascular ischaemia and reperfusion injury during cardiopulmonary bypass. Eur J Cardio-Thorac. 50, (6), 1035-1044 (2016). Zhang, Z., Wu, Y., Zhao, Y., Xiao, X., Liu, J., Zhou, X. Dynamic changes in HMGB1 levels correlate with inflammatory responses during cardiopulmonary bypass. Exp Ther Med. 5, (5), 1523-1527 (2013). Kohno, T., et al. Impact of serum high-mobility group box 1 protein elevation on oxygenation impairment after thoracic aortic aneurysm repair. Heart Vessels. 26, (3), 306-312 (2011). Tseng, C. C., et al. Impact of serum biomarkers and clinical factors on intensive care unit mortality and 6-month outcome in relatively healthy patients with severe pneumonia and acute respiratory distress syndrome. Dis Markers. 2014, (2014). Paparella, D., Yau, T. M., Young, E. Cardiopulmonary bypass induced inflammation: pathophysiology and treatment. An update. Eur J Cardio-Thorac. 21, (2), 232-244 (2002). Hirao, S., et al. Recombinant human soluble thrombomodulin prevents acute lung injury in a rat cardiopulmonary bypass model. J Thorac Cardiov Sur. In Press. (2017). Yamazaki, S., Inamori, S., Nakatani, T., Suga, M. Activated protein C attenuates cardiopulmonary bypass-induced acute lung injury through the regulation of neutrophil activation. J Thorac Cardiov Sur. 141, (5), 1246-1252 (2011). Wang, C. T., Zhang, L., Wu, H. W., Wei, L., Xu, B., Li, D. M. Doxycycline attenuates acute lung injury following cardiopulmonary bypass: involvement of matrix metalloproteinases. Int J Clin Exp Patho. 7, (11), 7460-7468 (2014). Liu, K., et al. Curcumin attenuates cardiopulmonary bypass-induced lung oxidative damage in rats. J Cardiovasc Pharm T. 17, (4), 395-402 (2012). Taki, T., et al. Fetal mesenchymal stem cells ameliorate acute lung injury in a rat cardiopulmonary bypass model. J Thorac Cardiov S. 153, (3), 726-734 (2017). Zhu, X., et al. Establishment of a novel rat model without blood priming during normothermic cardiopulmonary bypass. Perfusion. 29, 63-69 (2014). Inoue, K., et al. Deep anesthesia worsens outcome of rats with inflammatory responses. Inflamm Res. 65, (7), 563-571 (2016). Bradfield, J. F., Schachtman, T. R., McLaughlin, R. M., Steffen, E. K. Behavioral and physiologic effects of inapparent wound infection in rats. Lab Anim Sci. 42, (6), 572-578 (1992).